1. My friend Bettie, at one time was the head nurse in pediatrics in the hospital where I worked. 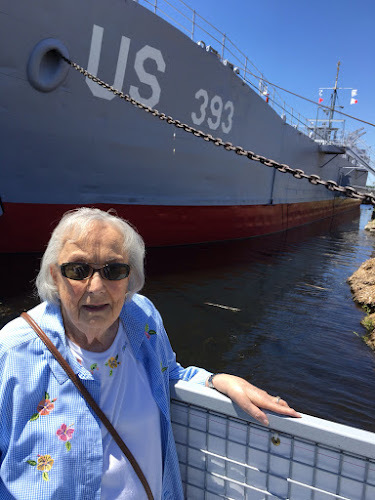 We have been trying to visit this LST 393 ship for the past few weeks. We finally succeeded. Bettie was in a Cadet Nursing Core group, and a RN,graduating in 1945. Someone told Bettie that there were some pictures of her along with some of the other cadets at the LST. We searched and searched today for her pictures with no luck. We did however find a picture of her husband who was a WW ll veteran and another picture of her husband's brother, both deceased. Bettie will soon be 92. We enjoy our weekly adventures together! 2. 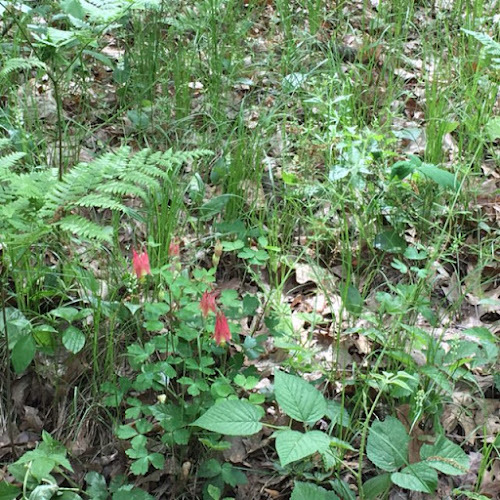 Mister Irish and I found some Wild Columbine in the woods the other day. 3. Great Grand Elijah is almost four months old and a very happy baby boy . . .
4. Some of you may remember this picture of me when I have posted it before . . . not sure what the event was . . . maybe it was playing "patty cake " or something. One thing I do remember though is feeling happy. I loved to play, laugh and discover. I remember being read to, cuddled, loved. I remember standing on my dads feet and dancing with him. I remember snuggling up next to my mum riding in the car, with my head resting on her fur coat. I can still "feel that feeling." Really nice. Funny how certain things stay with us. 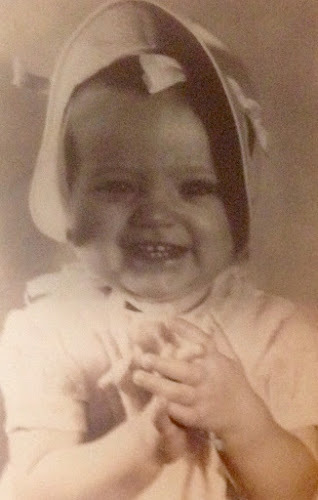 I thought I would show this picture because I still feel like that "happy kid" today. Especially right now when I'll be celebrating "seventy seven on the seventh!" It's been a good life . . .
5. Aren't Peonies just beautiful . . . Not my picture or my Peonies. Neighbor friends niece was married this past weekend. The mother of the bride, sister of my neighbor, posted this picture on Facebook of these Peonies from the wedding. I have had no luck growing them. This is my year to try again. I'll let you know how I do! "Tell me you love me, " he says. Bettie looks wonderful for 92 and great that she can still get out and about. 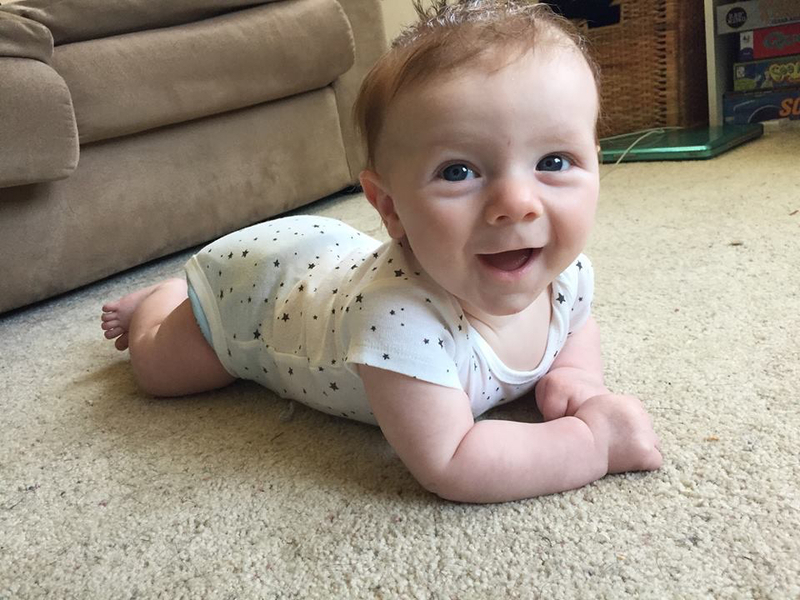 Elijah certainly looks a happy baby. What a lovely post, Lynne. The picture of you is adorable. I remember the pleasure of leaning against my mother's fur coat and enjoying the cool softness against my face. Thank you for bringing that memory back. Little Elijah does look so happy! 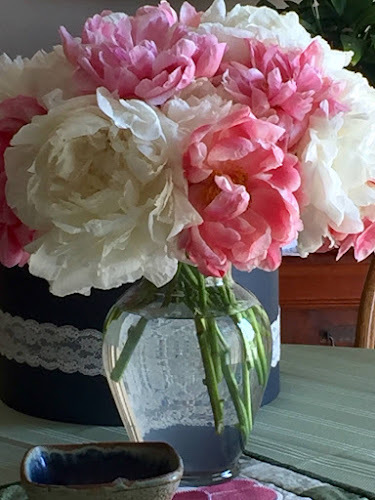 Love everything in this post -- patty cake, peonies, baby grand! Happy weekend, Lynne! Happy Early Birthday! My peonies are blooming this year, first time in about four years or more. I was so surprised to see the blooms.